I know the feeling. I had that exact same wide-eyed look of awe and wonder in my eyes as I watched Ponyo. Then again, this is a Hayao Miyazaki film; how could I not be entranced? introduced to a plucky little goldfish, just one of the many daughters of an undersea sorceror named Fujimoto. He's fiercely protective of his family; scowling at the way humans continually exploit each other and the world around them, Fujimoto is determined to keep his children at arm's length from the reach of man. This impulsive and adventurous goldfish ventures out a little further than she should've, and she winds up stuck in a discarded glass jar. A five year old named Sosuke spots that jar glistening in the water, just on the edge of his house on a cliff near the sea. Sosuke quickly rescues the trapped little fish, and from that point on, the two of them are inseparable. Sosuke's fascinated with this goldfish he's named Ponyo, and she's so taken with her newfound brother that she wants to be human too. 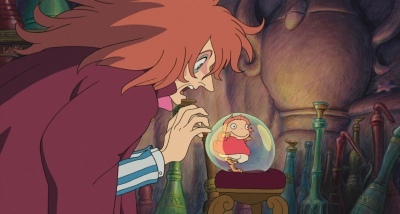 As luck would have it, Ponyo has enough magic bubbling around inside her to transform herself. The legends go that when a fish with the face of a human is separated from the sea, the ocean grows restless until she's returned safely. Their sleepy little port town is flooded by a typhoon in the wake of Ponyo's escape, and in the wake of all that chaos, Sosuke and his mother are separated. 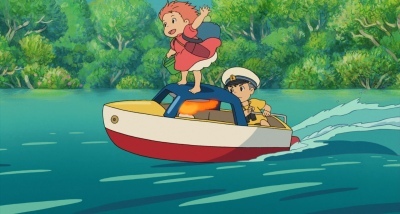 Ponyo and Sosuke set out in an oversized toy boat to meet back up with her, and the adventure that follows could completely change the face of two very different families forever. Ponyo has a playfulness that harkens back to My Neighbor Totoro. Much like that earlier film of Miyazaki's, there isn't any sort of moustache-twirling villain to overcome. Neither film ever gets overly distracted by the plot; the story's really only there to introduce these characters and to build out a fantastic dream world for Miyazaki to explore. In fact, there's quite a bit of backstory that Ponyo glosses over -- quick off-hand mentions like Fujimoto stating that he'd renounced being human without any sort of flashback or exposition explaining why -- but that completely works in the context of the film. Ponyo doesn't explain any more than is absolutely necessary to understand the scene that's currently unspooling in front of you. Miyazaki has always been one to prefer to show rather than tell, and part of the magical wonder the film inspires is drawn from that abstract approach...its disinterest in explaining every last detail. You're seeing these events unfold through the eyes of a five year old, after all, so everything is kind of a fascinating new adventure. Don't take 'adventure' the wrong way, though; there isn't any sense that Ponyo or Sosuke are ever in any immediate danger. 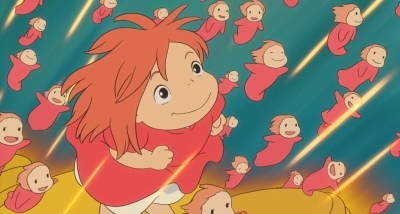 Ponyo is a film about discovery and familial love, not breakneck escapes or manic chases. There's no darkness and little danger at all, and even the youngest viewers shouldn't be upset by any of the imagery that's splashed across the screen. towering waves of a typhoon, but I found myself every bit as enthralled with the far more grounded sight of Ponyo staring wide-eyed at a baby on the verge of falling asleep. 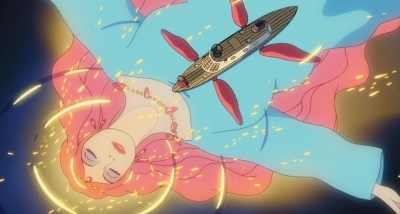 When I think back to my favorite moments in the film, the first scenes that come to mind aren't the more colossal ones, like Ponyo inadvertently winding up swimming around in a pool of magical elixirs. No, what winds up lodged in my mind is a smaller scene like Ponyo and Sosuke eagerly waiting for their ramen noodle dinner to finish cooking. With so many family movies starting with some high concept plot and disinterestedly dropping in one-note characters since someone has to be around to service the story, it's such a pleasure to watch something like Ponyo that instead focuses on richly drawn characters I want to spend so much time with like this. There's something so immediately engaging about Ponyo's childlike sense of wonder, and the movie deftly manages to inspire the same. Some viewers may be turned off by the stripped-down plot...the limited action and Ponyo's lack of interest in explaining the mechanics of what makes this world work. To me, these are strengths, not missteps. If Ponyo does anything wrong, it's that the film repeatedly states that Sosuke and Ponyo's adventure is building up to an important test, but what takes the place of the climax instead is something much simpler and low-key. The resolution is absolutely charming, seamlessly fitting the tone and approach of the rest of the movie up to that point, but it almost seems as if Miyazaki is just trying to brush the ending out of the way. He's far more driven in introducing these characters and spending time with them, not trying to come up with the best way to shove them out of the frame now that Ponyo has come to an end. I also greatly appreciate the fact that the two young children that drive Ponyo are so warm and likeable. They're not snarky and sarcastic the way the leads in a lot of movies these days so often are, and that lack of cynicism makes their awe that much more infectious. There aren't any clunky pop culture references or bodily humor gags to get in the way either. Ponyo is so artfully crafted -- so warm, so funny, so intelligent -- that it doesn't need to lean on that sort of laziness as a crutch. overlooking how beautiful a film Ponyo is. Hand-drawn animation may be a dying art, but Ponyo takes full advantage of the medium and shows how much life the artform still has in it. This would be an unrecognizably different movie if translated to CGI, no matter how skillful the hands behind a computer-rendered version may be. Ponyo places its characters against gorgeous hand-crafted backgrounds, with its texture, brushstrokes, and sketched look to its pastels still intact. I'm particularly smitten with the way Miyazaki renders the sea. Rather than trying to mimic the movement and appearance of water as closely as possible, he chooses instead to stylize it. 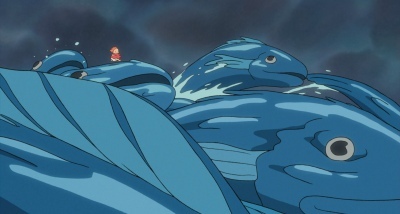 As Miyazaki puts it, the water throughout Ponyo is itself a living creature. The character designs are consistently spectacular, and the animation is so expressive, nuanced, and fluid that I found myself wholly escaping into it. Ponyo and Sosuke in particular quickly start to feel like people rather than digital ink and paint on that oversized TV in front of me. I've seen Ponyo repeatedly dismissed as one of Miyazaki's lesser films, but even though this isn't a movie that's particularly deep or fraught with danger, I was never anything less than entranced throughout. I'd go so far as to say it's my favorite work of his from the past decade, resonating with me in a way that the Academy Award-winning Spirited Away never quite did. Like Kiki's Delivery Service and My Neighbor Totoro before it, Ponyo brings out the gentler side of Miyazaki, one that looks at the world with a child's sense of awe and wonder. The film never panders to its audience, instead relying on its sublime beauty and richly-drawn characters to draw viewers into its world. As terrific a year as 2009 was for animation, Ponyo may be my favorite of all of last year's many animated releases, and I'm tempted to say that it ranks among the best of the year, animated or otherwise. Very, very Highly Recommended. It's also worth noting that Ponyo uses seamless branching to distinguish between the Japanese and American versions of the film on this disc. The English version has different opening and closing titles, including a dance-pop take on Joe Hisaishi's title track. When the Japanese option is selected through the Languages menu, its original titles are presented instead. Ponyo is one of the singularly most gorgeous films I've ever had the joy of experiencing in high definition. This Blu-ray disc is a showcase for the dazzling artistry and craftsmanship of Studio Ghibli: the fluidity of the animation, the startling crispness and clarity of the line work, and its bright, breathtakingly vivid palette. The brilliant blues of the ocean, the lush greens of Sosuke's lawn, and the candy-colored sealife and clothing could just never hope to be reproduced like this on DVD. This Blu-ray disc also does a spectacular job bringing out the texture of Ponyo's hand-crafted backgrounds, and when the camera eases back, characters that'd be reduced to a muddy smudge on DVD remain clearly defined here. As Ponyo has been transferred to Blu-ray directly from digital elements, there isn't any wear or film grain to fret about either. The 1.85:1 image is remarkably clean and clear, not marred by any trace of edge enhancement, excessive digital noise reduction, or any hiccups whatsoever in its AVC encode. I'm floored by just how indescribably beautiful Ponyo is in high definition, and honestly, Miyazaki enthusiasts who've been on the fence about upgrading to Blu-ray may find this disc alone to warrant an investment in a BD player. It's absolutely flawless, and I'm now even more eagerly anticipating further Studio Ghibli releases on the format. this Blu-ray release of Ponyo does include the film's original Japanese soundtrack, it's only offered as a lossy Dolby Digital 5.1 track. The English dub, meanwhile, is lavished with 24-bit DTS-HD Master Audio. I'd imagine that a considerable portion of the audience who'd be more likely to pick up this Blu-ray disc over a traditional DVD are rabid Miyazaki fans, and as they'd almost certainly want to hear its original soundtrack in the highest quality possible, it's a shame that Disney opted not to give it the same treatment. Plenty of other studios routinely include lossless soundtracks in multiple languages, so unless the seamless branching is somehow getting in the way, there shouldn't be any technical reason that Ponyo couldn't have offered DTS-HD Master Audio tracks in both English and Japanese. Purists may still be scowling, but it's worth noting that the English dub really is terrific. The lead performances by Noah Cyrus and Frankie Jonas are sweetly charming, and it's easily argued that Jonas even does a better job conveying that Sosuke is only five years old. If not for a couple of direct mentions of his age and the fact that he's still enrolled in pre-school, it's not hard to picture from the Japanese version that a character as independent as Sosuke is closer to seven; Jonas does a more convincing job making it feel as if Sosuke and Ponyo are much closer in age. Ponyo's dub isn't a direct translation of the Japanese dialogue, but it doesn't take any sweeping liberties, and the adjusted script even fleshes out a few minor story points that the Japanese release glosses over. I'll freely admit to liking Ponyo's dub, but still, the Japanese audio just sounds right to me. I can't quantify it, exactly; the original performances just gel better to my mind with the imagery being splashed across the screen. There's a certain tone...a certain feeling...that the Japanese dialogue evokes that the English dub can't quite reproduce. the English and Japanese soundtracks. Never anything less than lush, organic, and alive, the mix is teeming with smooth pans from one channel to the next and a remarkably strong sense of directionality. Sealife and insects skitter across the frame, waves gently lap in the background, and blades of grass rustle in the breeze. The surrounds do a marvelous job reinforcing the action as well, from Lisa's frantic driving sending her tiny sedan careening all over these winding roads to the violent crashing of tidal waves during the typhoon. Dialogue is also impressively clean and clear in both soundtracks. As terrific as the lossy Japanese audio is, it still pales in comparison to the far more robust DTS-HD Master Audio dub. The typhoon sequences roar with a ferocity in the English dub that seems so much more meek and polite in the Japanese soundtrack. The soaring strings in Joe Hisaishi's score also come across as much more subdued in the lossy Japanese track. There's a very noticeable gulf in distinctness and clarity between these two soundtracks, and bass response is also considerably different between them. The Japanese audio belts out a decent low-end -- Ponyo bursting out of her bubble aquarium, that cute little goldfish bounding off of oversized jellyfish, the military marching drums in the score, and the storm sequences in particular -- but it has a much lighter touch than the thundering English soundtrack. How much of that is owed to the extra headroom the lossless audio has and how much is from the English version possibly being lavished with a much more aggressive mix, I really couldn't say. The Blu-ray release of Ponyo in Japan -- also being issued by Disney, by the way -- reverses the situation we're seeing on these shores: lossless Japanese audio and a lossy English dub. Unfortunately, the price tag for an import is pretty daunting, and purists can expect to pay at least a $30-$40 premium if they want a master-quality version of the film's original soundtrack. I'd have rated this Blu-ray disc a perfect five stars if the quality of the Japanese audio on this disc matched the spectacular sound of the English dub. What's offered here in Ponyo's native tongue does sound great, but the presentation still certainly pales by comparison. When selecting the Japanese soundtrack, traditional English subtitles are selected by default. The dub only features English subtitles that are captioned for the deaf and hard of hearing along with French and Spanish streams. A French dub is also available in Dolby Digital 5.1. Meet Ponyo (3 min. ; HD): Ponyo opens with an optional introduction that touches on Studio Ghibli's relationship with Disney and how much love and care went into bringing the film over to these shores. picture-in-picture extra places all of the storyboards for Ponyo -- many of which have been lovingly painted -- in a small window in the corner as the movie unspools. The World of Ghibli (HD): "Enter the Lands" presents all of Studio Ghibli's films as being part of one giant island, appropriately enough. Characters spanning many different movies are scattered throughout, but viewers can only hone in on four of these films. Ponyo features a quick quiz that'll tell a player which character from the film he or she is the most like. The others explore each of the main characters from Kiki's Delivery Service, My Neighbor Totoro, and Castle in the Sky, serving up very lengthy montages accompanied by voiceover narration from each film. Even a few props are interactive, such as Totoro's spinning top and Kiki's radio. A Conversation with Hayao Miyazaki and John Lasseter (4 min. ; HD): In this conversation between two of the most towering talents in animation today, Miyazaki speaks about the different character designs, including the initial inspiration for Ponyo and what each of her forms represent. Lasseter also prompts a discussion about the stylized way water is presented in the film. Creating Ponyo (4 min. ; HD): Miyazaki opens the featurette by explaining that he wanted to make a film geared towards five year olds, an audience he'd never fully embraced previously. The central focus of the conversation is mankind's relationship with nature and how Ponyo plays into that concept. 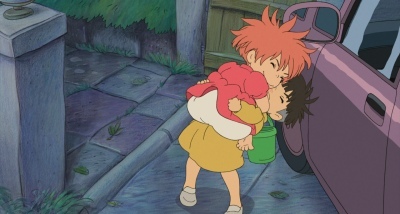 Miyazaki also delves into the character of Sosuke and how he embraces the wild, uninhibited Ponyo for who she really is. Ponyo and Fujimoto (4 min. ; HD): The second character-centric featurette swirls around the relationship between father and daughter as well as how this ties into Japanese culture. 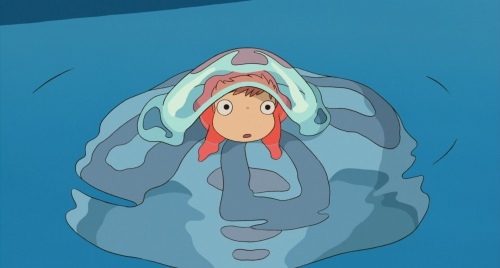 Miyazaki also reveals the origin of Ponyo's name. The Nursery (2 min. 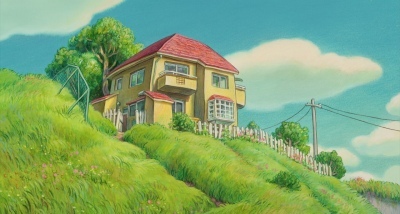 ; HD): Miyazaki was inspired to open a children's nursery at the Studio Ghibli compound, and "The Nursery" offers a glimpse at how it impacted Ponyo and nearly became an integral backdrop for the film. Producer's Perspective: Telling the Story (2 min. ; HD): The stories for each of Miyazaki's films have all been constructed in a very similar way, and "Producer's Perspective" follows that process from the initial image board brainstorming all the way through to the fully-polished animation. The Locations of Ponyo (10 min. ; HD): The longest of the disc's featurettes, "The Locations of Ponyo" offers a peek at how a company retreat to Seto Inland Sea had a profound impact on Miyazaki. The writer/director was compelled to return to this sleepy port town for an extended stay that crept into Spirited Away and greatly inspired Ponyo. The featurette takes viewers on a tour through the town, including a look at the real-life house on the cliff by the sea. Finally, we learn how the heritage of this time capsule of a town is being threatened by looming modernization. also delves into the themes for the other Ghibli films being re-released in this wave on DVD: My Neighbor Totoro, Kiki's Delivery Service, and the midnight inspiration of Castle in the Sky. Behind the Microphone: The Voices of Ponyo (6 min. ; HD): The last of Ponyo's featurettes is an extended look at the English dub being assembled, including quite a bit of footage of the cast at work, and seemingly everyone has a chance to speak about their take on the story and their performances. Trailers (3 min. ; HD): Two of Ponyo's original Japanese trailers have also been included on this Blu-ray disc. High definition trailers are also offered for a slew of other Disney releases, including Beauty and the Beast, Toy Story 3, and Fantasia. Other Studio Ghibli Releases (8 min. ; HD): To further cross-promote the DVD re-releases of a few other Studio Ghibli films, brief but still very intriguing retrospective featurettes are offered for My Neighbor Totoro and Kiki's Delivery Service. Castle in the Sky isn't given quite that same sort of attention, but its three minute segment does feature high-resolution scans of character sketches from the film. Ponyo also comes packaged with a standard definition DVD of the film, and the set arrives in a glossy, embossed cardboard sleeve. This is a BD Live-enabled release, but as I write this, the switch hasn't been flipped on for any of that online functionality. Ponyo is aimed at a younger audience than most of Miyazaki's films, and the story is simpler than usual to match. Still, Ponyo captures every bit of the magic and wide-eyed awe I've come to expect from Studio Ghibli. It's a sweet, charming film that draws its strength not through sprawling, incendiary battles but through small splashes of color from characters it deeply, truly loves. That attention to detail coupled with Miyazaki's incomparable visual eye and the studio's entrancingly gorgeous animation make for one of the most memorable experiences I've had watching a film on Blu-ray...animated or otherwise. The only disappointment I have with this Blu-ray disc is that the original Japanese soundtrack hasn't been lavished with the same quality audio as the English dub, but considering how exceptional the film and every other aspect of this disc is, Ponyo very much still comes Highly Recommended. Disney has a $10 off coupon for Ponyo available at www.ponyocoupon.com. Ponyo would've come enthusiastically recommended regardless, but especially after taking this additional discount into consideration, this Blu-ray disc is all but impossible to overlook.